Lungu says Zambians must not be emotional and get so furious to extents of burning down police posts and beating his police officers adding that doing so is only stupidity. In his words Lungu said”mwebena Zambia mwilafulwa fulwa, bushe abantu baku kafue filya bachitile naba Copperbelt ifi ngumfwile ati nabo nabocha police post nokupepekana naba kapokola mano? Awe temano aya,bupubafye. In other words Lungu says people of Kafue are foolish with their Copperbelt counterparts. It is clear that outgoing PF president is the one commanding the Police to be beating people as he has clearly indicated that he will support Police and not voters. Actually, the PF Presidential candidate said this in Church in Chawama were the preacher, a little girl told him to drink responsibly. 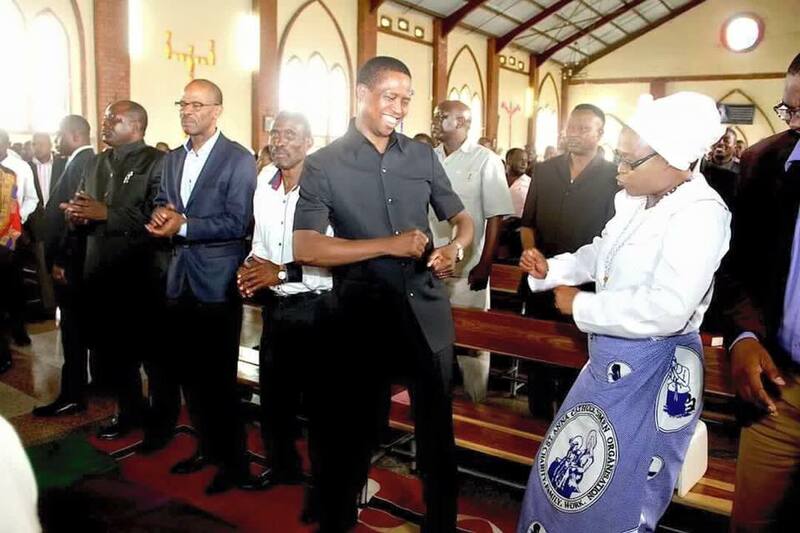 While everybody was reverently paying attention to the preacher, Lungu and this woman break into furious dancing in Church.